From the lovely people over at Hallmark, I bring you the Wizard of Oz Itty Bittys collection. Iconic and loveable characters from the cinematic treasure The Wizard of Oz , Dorothy™, Scarecrow™, Tin Man™, Cowardly Lion™, Wicked Witch of the West™ & Glinda the Good Witch™ have followed the Yellow Brick Road™ and joined the itty bitty family. The Wizard of Oz Itty Bittys collection were recently featured within my Five Wizard of Oz Themed Gift Ideas post and really do make the ideal gift for young and old. Adan Chung sketched a quick interpretation of what popular characters could look like if they were just a bit “itty bittier.” Soon, Adan’s simple-but-fresh portrayal of popular licensed characters inspired an entire collection that continues to grow. Now within the itty bitty family, are some of the most iconic characters of all time, with many more characters on the way. With their small stature and super-cute style, they make the perfect gift or stocking filler. Even if it’s a treat for yourself itty bittys are perfect for every occasion. itty bittys may be small but there’s certainly a whole lot to love! 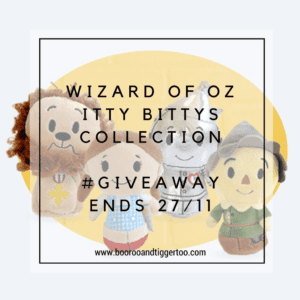 Hallmark have kindly given us an additional set of the Wizard of Oz Itty Bittys collection to giveaway to one lucky reader.